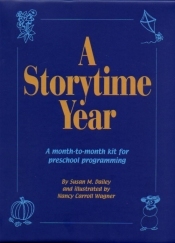 This practical resource is packed with suggestions and activities for anyone who plans programs for young children. The 48 theme-based units contain 20 original participatory stories, over 100 original participation activities and almost 400 reproducible illustrations. In addition to original and traditional material, the units also include citations to activities from other professional resources. Each unit contains an annotated bibliography, a storytelling activity, video suggestion, participation activities-- fingerplays, songs, games--and a craft project. The themes range from such traditional topics as the seasons and holidays to popular subjects like pizza, baths and nonsense. The book comes in a three ring binder, which allows pages to be removed for easy photocopying of illustrations. During the author's 25 years of library experience, she has planned hundreds of programs. She utilizes this practical knowledge to develop a valuable resource for the beginner or expert storyteller.